Although the shortest day is firmly behind us, the bitter bulk of winter lies ahead. We’ve got off lightly here in Broadstairs. It has been wet and windy; cold at times, but not frosty, so far. My garden is small enough to be undemanding through the winter months, leaving me time to focus on indoors. Here, in the warm and dry, my houseplant collection is burgeoning. Unlike outdoors, there’s still room for a few more. There are always tender plants which don’t quite make it into the garden room or greenhouse in autumn, either because they are too large and gangly, or because I am too lazy to move them. These outcasts have to fend for themselves. I give them the best possible chance by moving them into the shelter of a wall or positioning them under an evergreen tree. Those that can cope with low light-levels survive in the garage. However, some plants just can’t be protected. 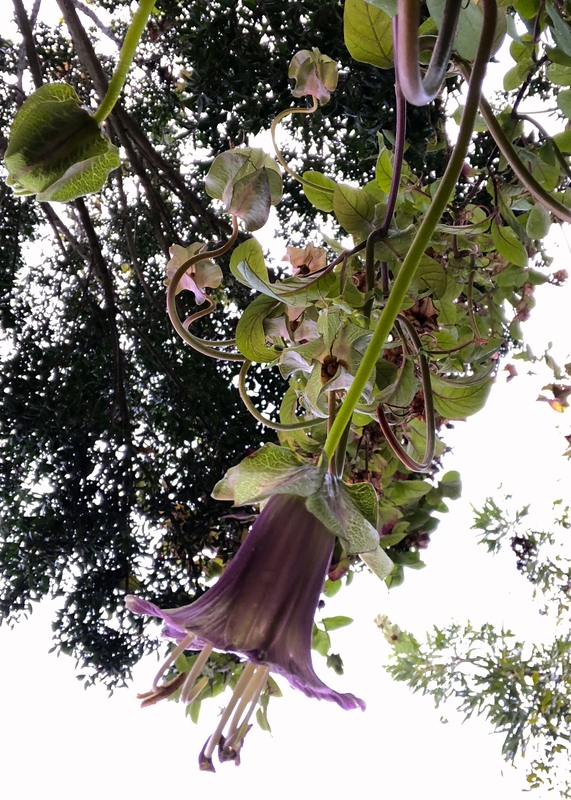 Such is the case with Cobaea scandens, the cup and saucer vine, which has scrambled 20ft into a tree, from whence it is cascading earthward again. Occasionally one of the swinging vines is tossed upwards into a neighbouring tree by the wind, and a new canopy is found to scramble over. Last year my cobaea almost made it through the winter unscathed. We had some air frost in February that yellowed the leaves covering the most exposed parts of the canopy, but lower down the flowers never stopped coming. These brave blooms tend to be a little bit insipid, never quite achieving the deep, satin-purple of summer. Even trapped in their greenish-mauve phase they are pretty and unusually exotic to look at. Glancing up this morning, I noted a heavy crop of drying fruits which will provide me with ample seed if I want to grow more in spring. I would like to try growing Cobaea pringlei, a close relative with large ivory flowers on elegant stems. The relative vigour of both climbers does not phase me, as I like the jungly look. Cobaea are brilliant plants if you want to hide something unsightly quickly and temporarily. I’ll be very fortunate if I get my cobaea through another winter unblemished. Even if frost comes, the roots are well enough protected that the plant is highly unlikely to be damaged fatally. My only challenge is getting up into the tree to remove any dead or congested vines. For that task, it’s me that needs to be brave. TFG. Thanks Paul – you too! I have not seen one of those in a very long time. I forgot what they look like, and I do not even know how they grow. Very easy from seed. They germinate quickly and grow fast. The vines are self clinging and rapidly cover a trellis, or rocket up a tree. Not generally hardy in the UK unless in a very sheltered spot. It is one of those things that I have read about, and I remember that they had been popular in Southern California, but that is about it. I remember hearing about them at a nursery in Marin County, but they probably lost popularity after they succumbed to a historically bad frost shortly afterward. Well Dan, on an extremely cold day – I was dressed for the Arctic with that easterly wind roaring up from Broadstairs – I managed to plant the last remaining bulbs, yes I did! 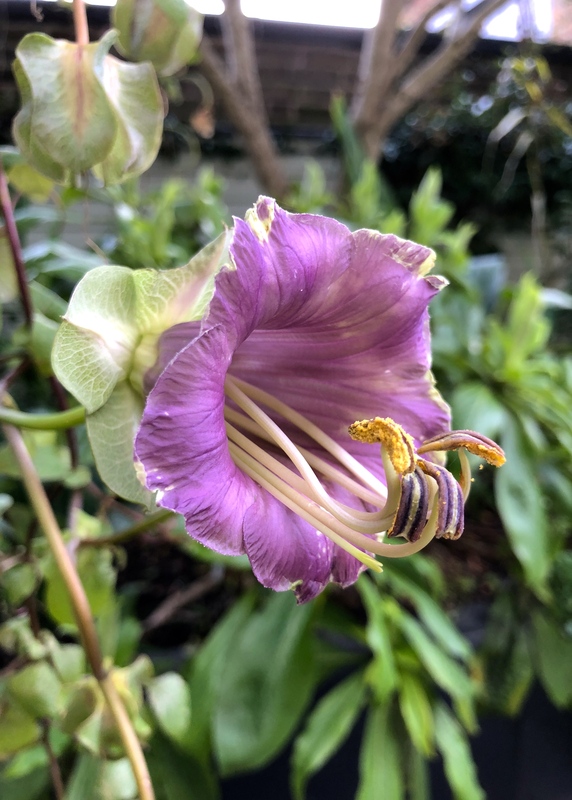 It is years since I grew cobaea – thanks for reminding me. Bought some very nice primroses on Saturday, make a good splash of colour on the steps to the front door and mingle nicely with the hellebores which are in flower. So much to do!